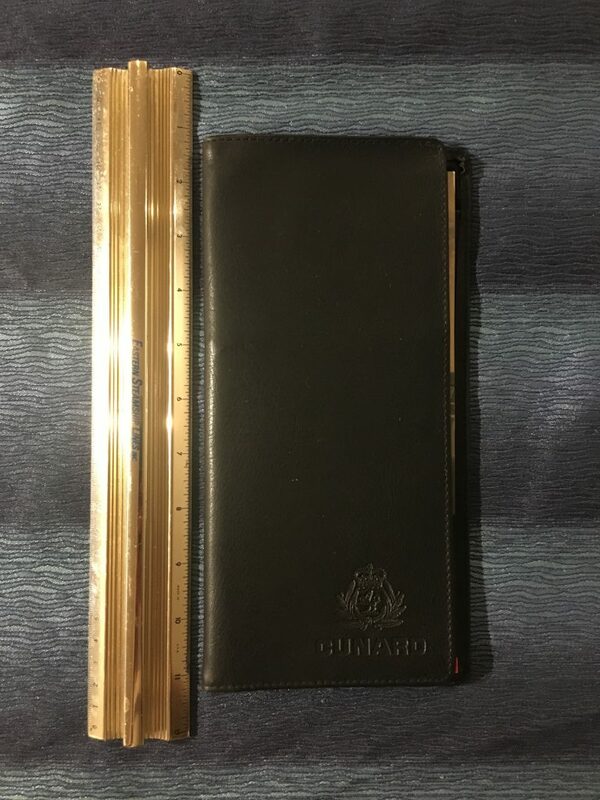 Great leather ticket holder in excellent condition. 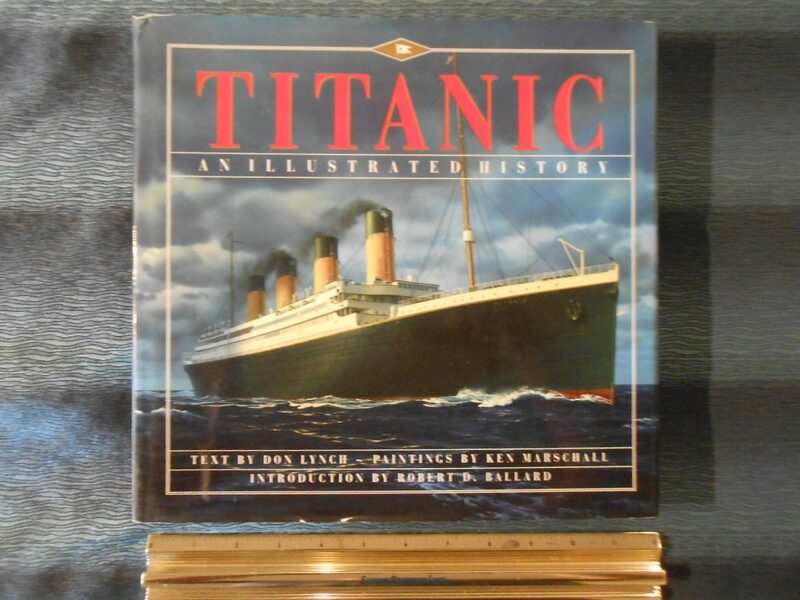 Includes the Cunard Travel documents booklet … and dates to a 2004 QE2 Eastbound Crossing. 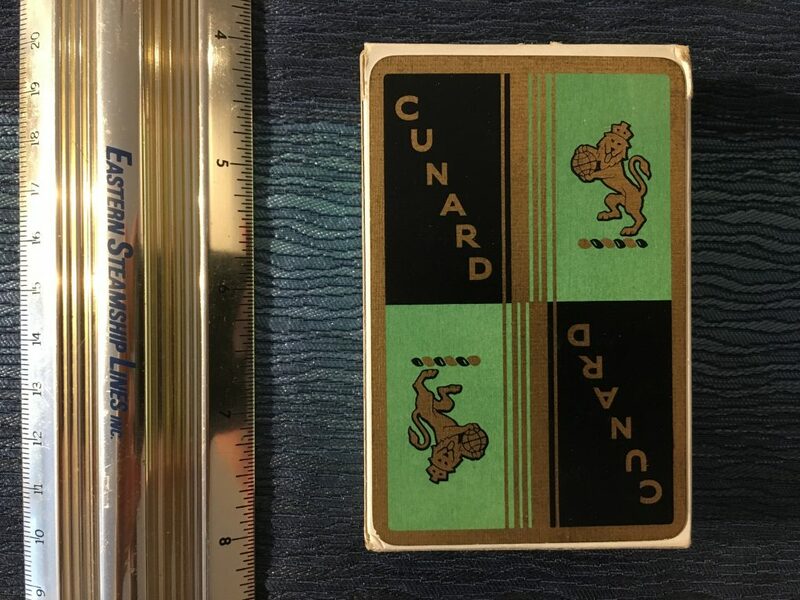 The cover is embossed with Cunard lettering and the Lion symbol. 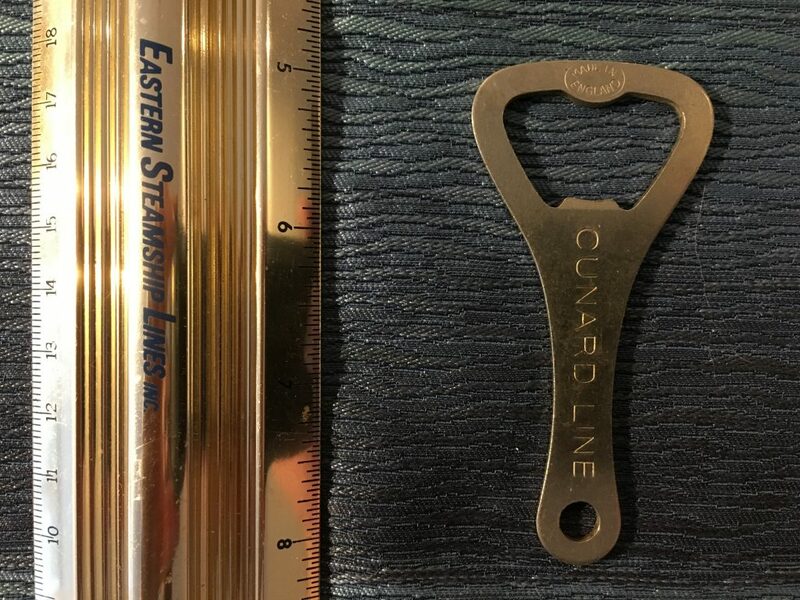 Cunard Line: 1969 QE 2 Maiden season Preview and Fares folders. 2 great folders for the QE2’s maiden season. 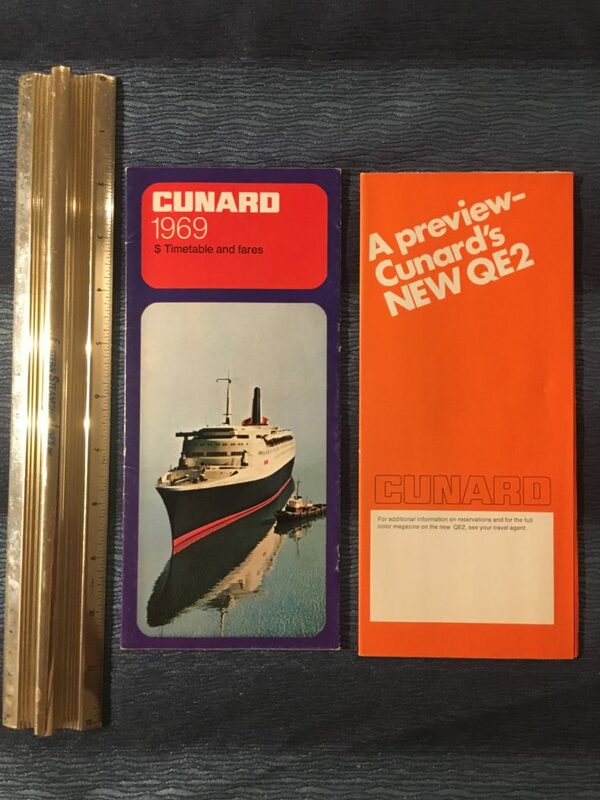 The orange preview folder is dedicated to the QE2’s voyages and rates the Cunard 1969 folder covers all of the services for the 1969 season for QE2, Carmania and Franconia. Excellent with minor scuffs from use. 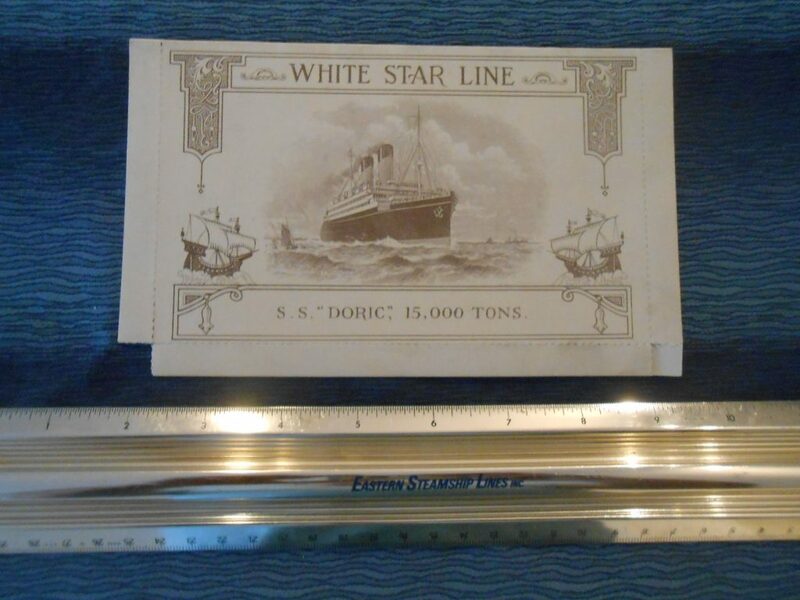 Pretty simple souvenir … and something for daily use! Lovely green sealed deck of playing cards. These seems to date form the Mid 50’s .. the green color is reminiscent of the Green Goddess Caronia. 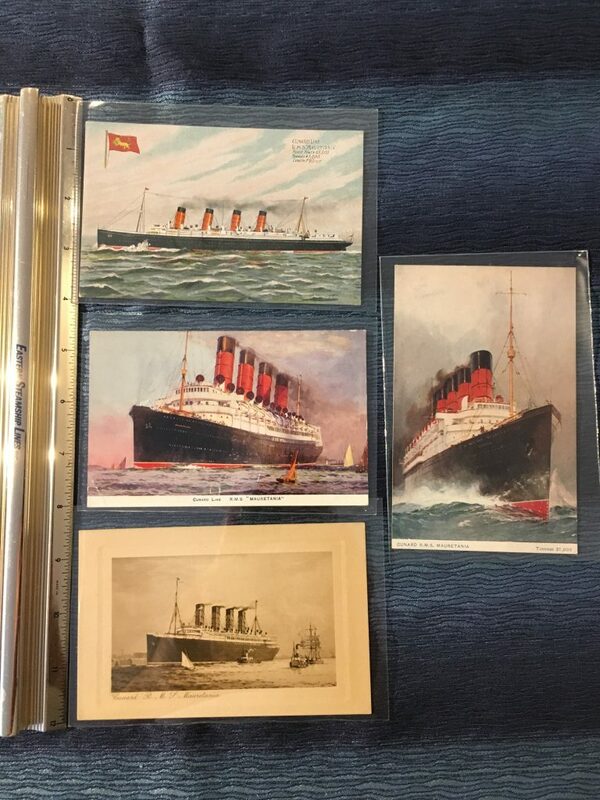 4 great cards for the speedy Mauretania. All 4 are unsent .. though one is written on. All 3 cards have some wear … 1 of them has some writing. 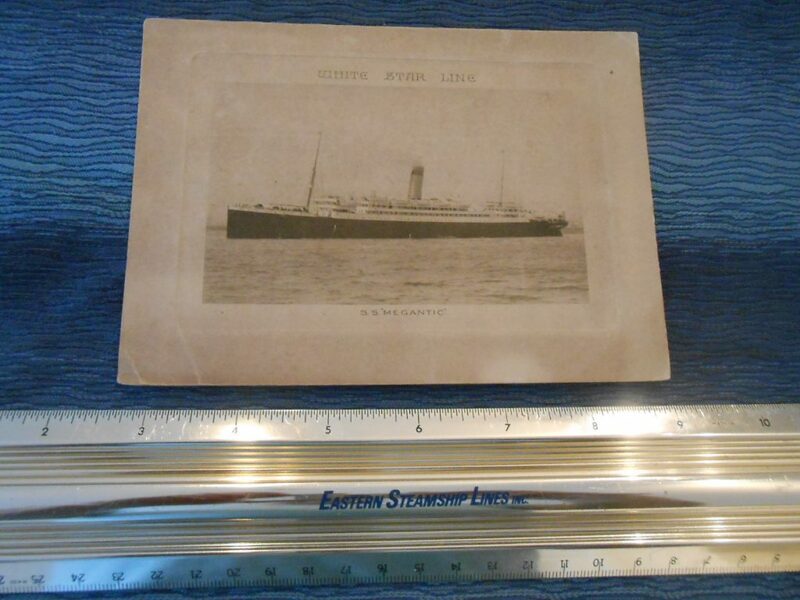 One of Cunard’s most successful liners. 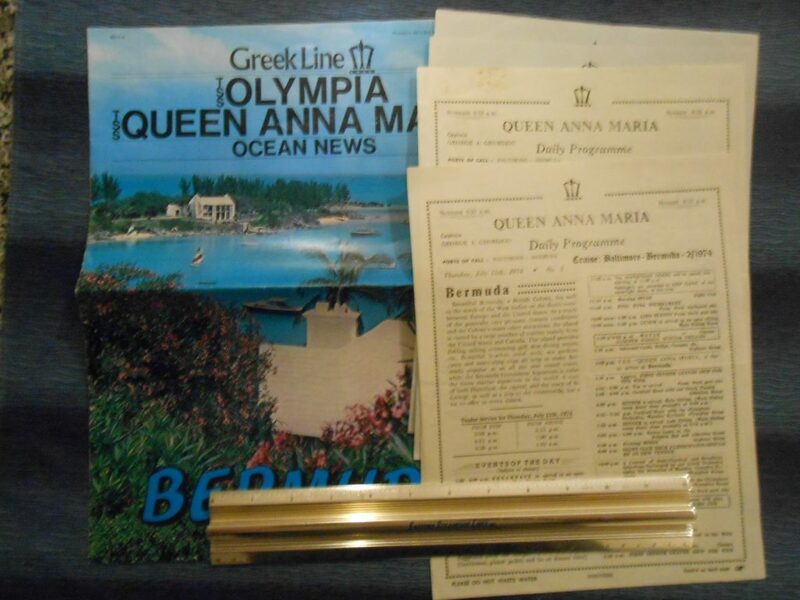 4 daily programs from 1974 as well as the Greek Line Bermuda colored “magazine” In good condition. Lots of activities onboard. Great unused card for the Carmania. 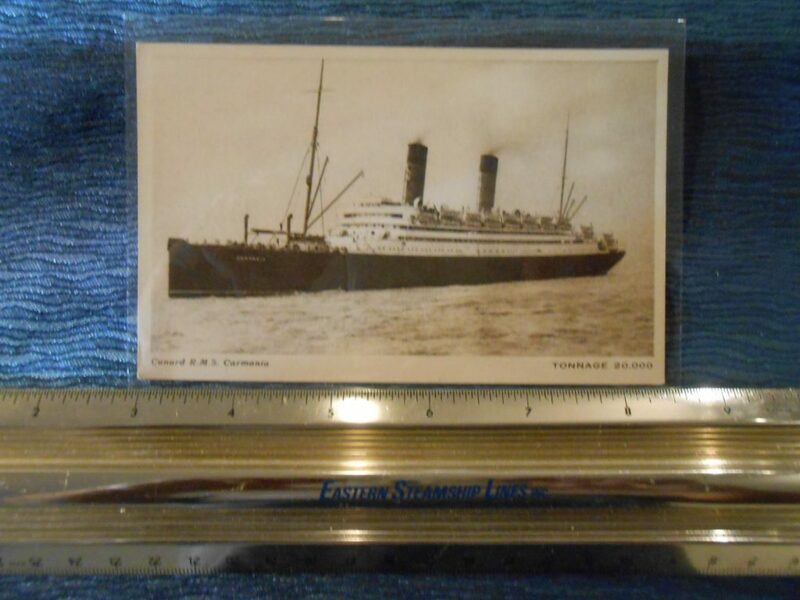 She had a good life with Cunard and was best known for her fierce battle in WW1 with the German Cap Trafalgar. 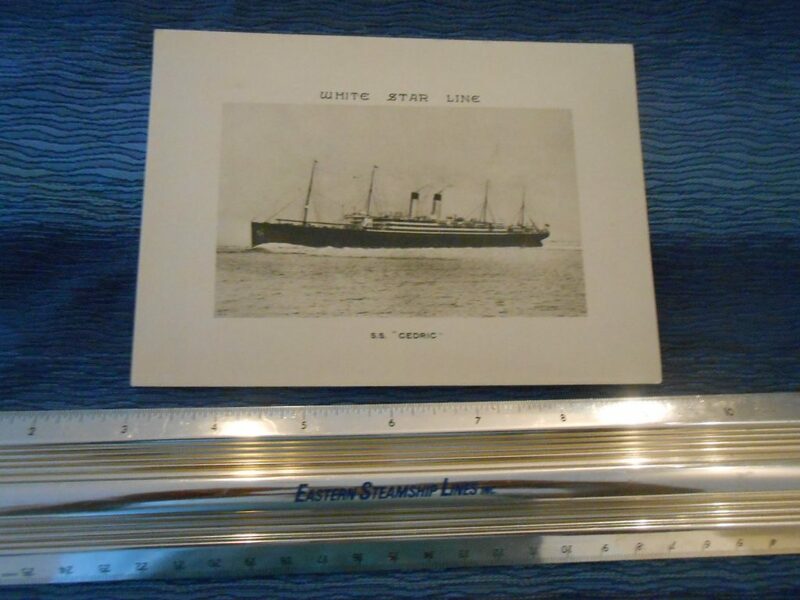 Unused and in nice condition … showing the ship at speed with a bone in her teeth and smoke and steam coming out her stacks. Nice set of cards for the speedy Campania. Both are unsent and not written on or sent … but do have some age and wear spots. Nice set of cards for the speedy Lucania. Both do show some age and wear. 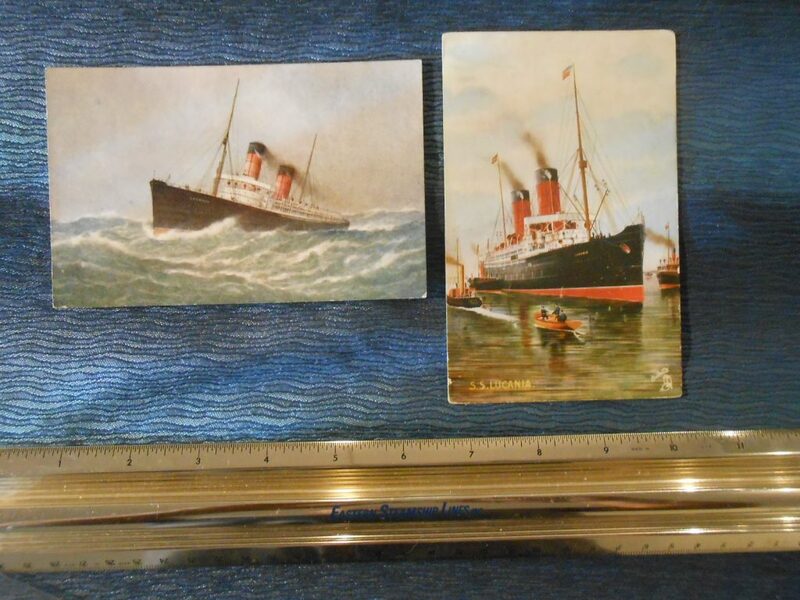 The first unused one shows the Lucania in rough seas (not a selling feature really) and the other is a Tucks post card that has been written on a mailed showing the ship with tenders nearby. WSL : Adriatic 8 Shore Excursion Sheets. 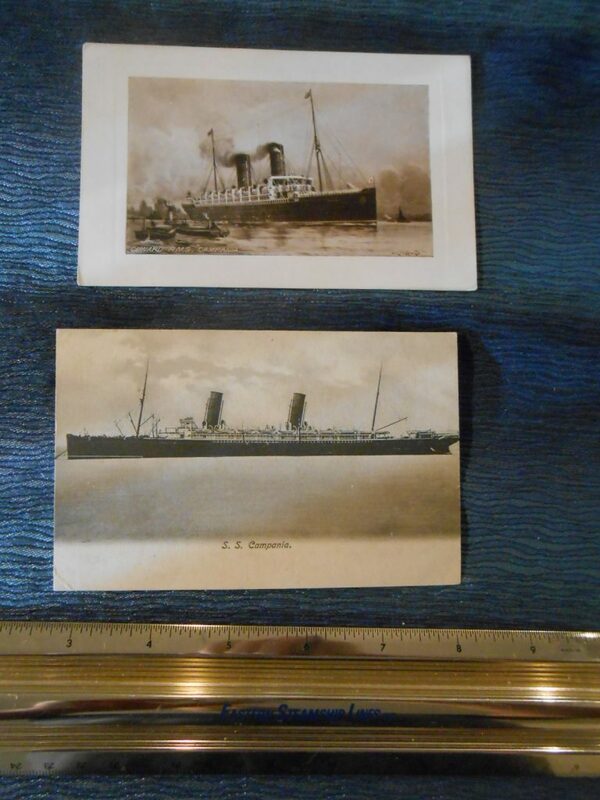 These seems to date form a March Med cruise … probably in the early 1930’s. 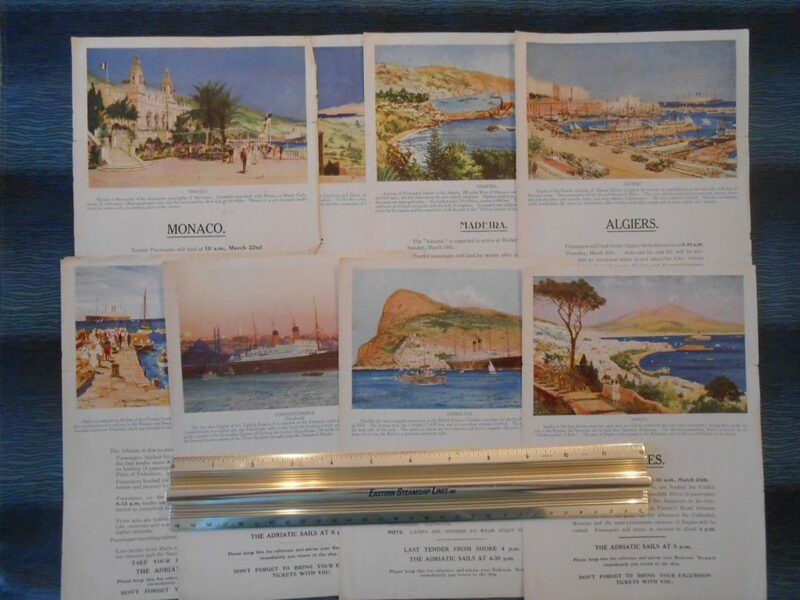 The Artwork and graphics are superb and represent stops at Athens, Monaco, Madeira, Algiers, Haifa, Constantinople, Gibraltar and Naples. In all of them you can see a WSL ship in the harbor … mostly a Big 4 Vessel (like Adriatic) … though the vessel at Constantinople is surely Homeric. The edges are bumpy as if removed from a folder or booklet and most have some fold lines etc. Nice set though! 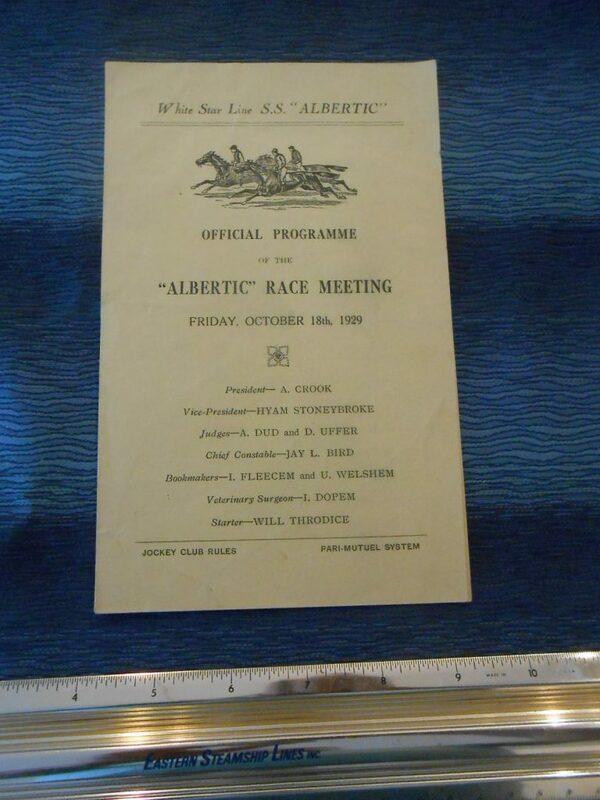 WSL: Albertic Horse Race Program dated 10/18/1929. Dated just 11 days before the Great Wall Street Stock Crash of 1929… is this lovely little horseracing program the carefree passengers would have enjoyed. It looks like there would have been 6 different races! 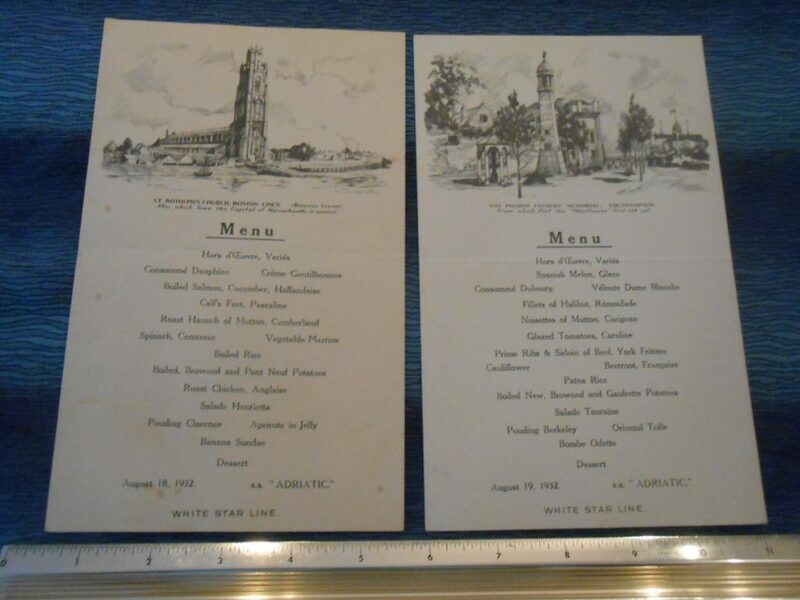 Dated consecutively August 18 and 19th 1932. One shows St Botolphs church in Boston and the other the Pilgrim Fathers Memorial in Southampton. The food looks quite lovely! WSL: Pristine Cedric Log Abstract Card. Dated August 16th 1930, She made the 2725 voyage from Ireland and England to NYC via Boston in in 7 days 0 hours and 54 minutes. This card is pristine and in like new condition. WSL: Celtic Log Abstract Card Sept 10th 1926. She made the 2670 voyage from the Ireland to NYC via Boston in in 7 days 3 hours and 59 minutes. This is browned with age and does have writing on the front and back. WSL: Megantic Log Abstract Card June 28, 1925. Browned with age … still interesting and a no so common ship. She made the 2464 voyage from Canada to Ireland in 6 days 5 hours and 51 minutes. 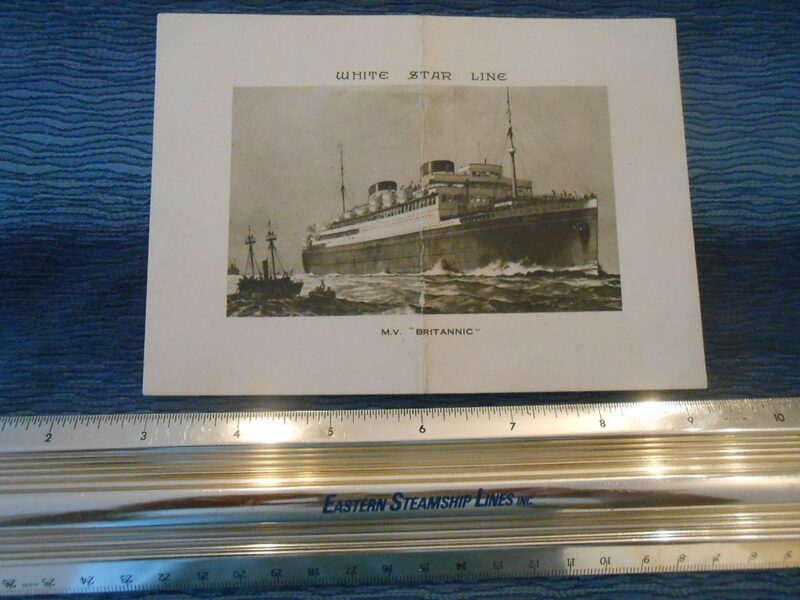 WSL: Britannic Log Abstract Card May 9th 1931. This is a little gem … though it has been folded. She made the 2799 voyage from the US to Ireland in 6 days 8 hours and 53 minutes. 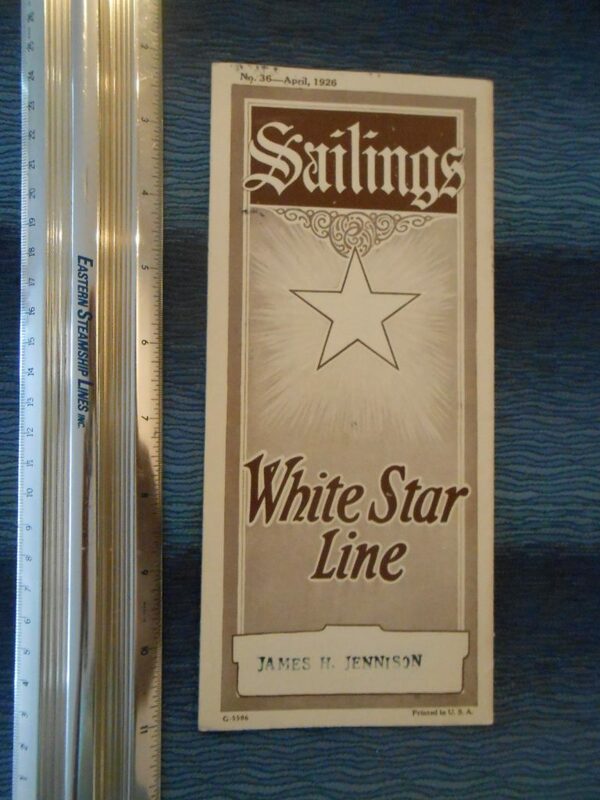 Simple heavy board menu card for the then tiny Germanic … at one time she would have been the largest ship in the fleet! Olives and Caviar top the list of selections … Devilled Sardines are at the end and would never have been on my plate. Dated 6/21/1908. 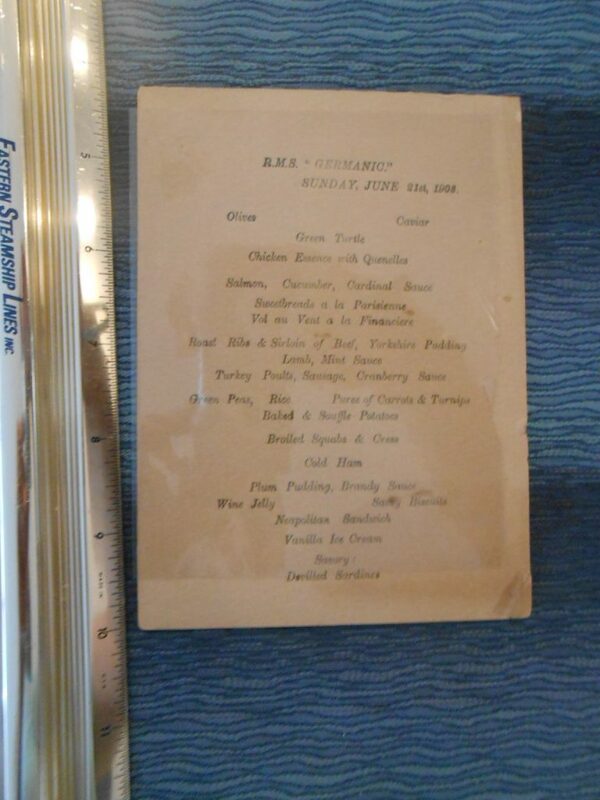 Cunard WSL: Majestic Landing Arrangements June 26th 1934. 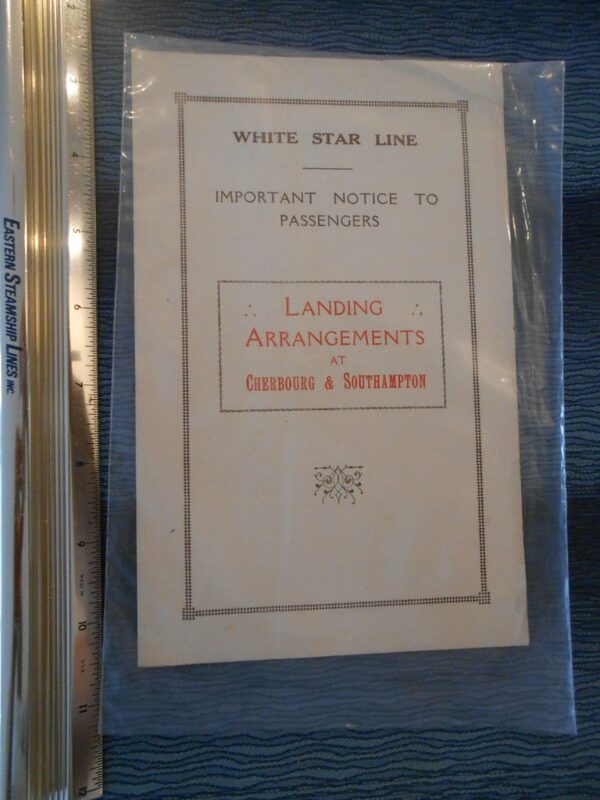 Nice little folder for the Flagship … printed onboard for the Cherbourg and Southampton landings 6/26/1934. Printed in both English and French. Unusual item to have survived. 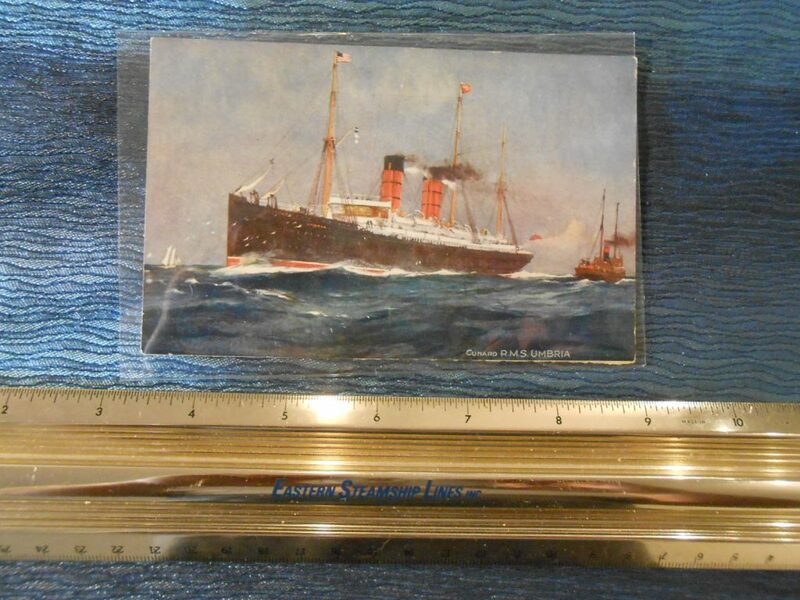 Great portrait Lettercard for the little ship. A few of the edge perforations are missing. 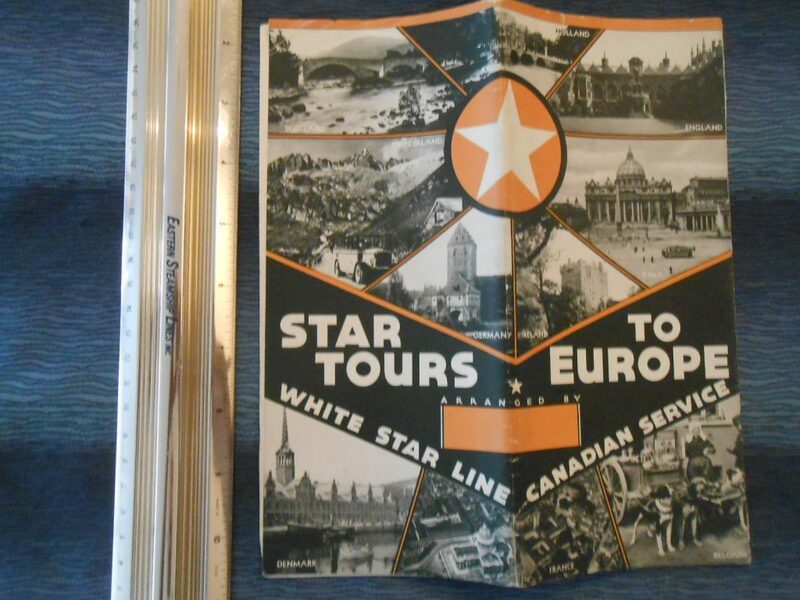 Interesting brochure that denotes 3 separate tours (A, B and C) for the 1932 summer season. 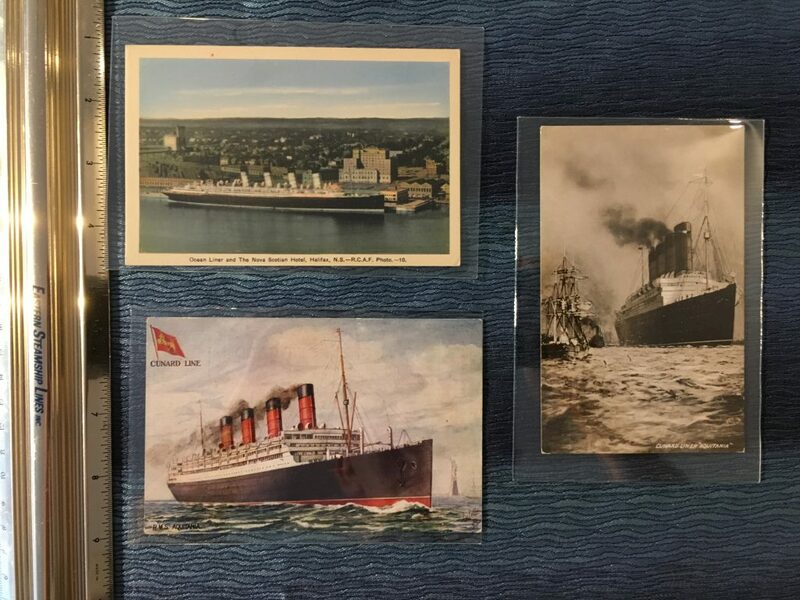 The brochure says these are in conjunction with the WSL Canadian service ..and I think the Doric was the main ship used ( though other vessels are mentioned). Memphis Tennessee agency stamp on the inside. 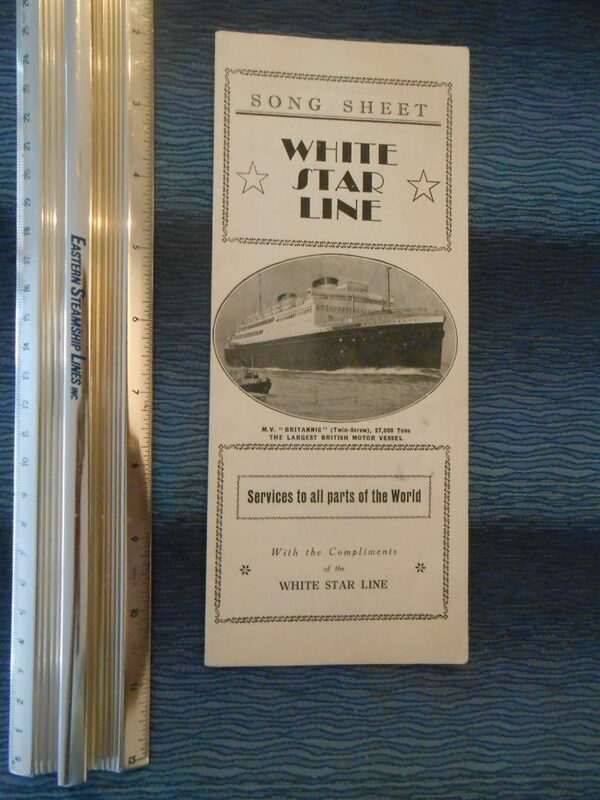 WSL April 1926 Sailing folder. Typical sailings folder for the WSL fleet … also includes Canadian and shared services … lovely ad for the Belgenland’s 3rd world cruise. Stamped James Jennison and printed on very smooth paper. Lovely song sheet of 36 selections that would have been passed out to passengers on any voyage. Thee would have been entertainment selections of a nice souvenir for the voyager. 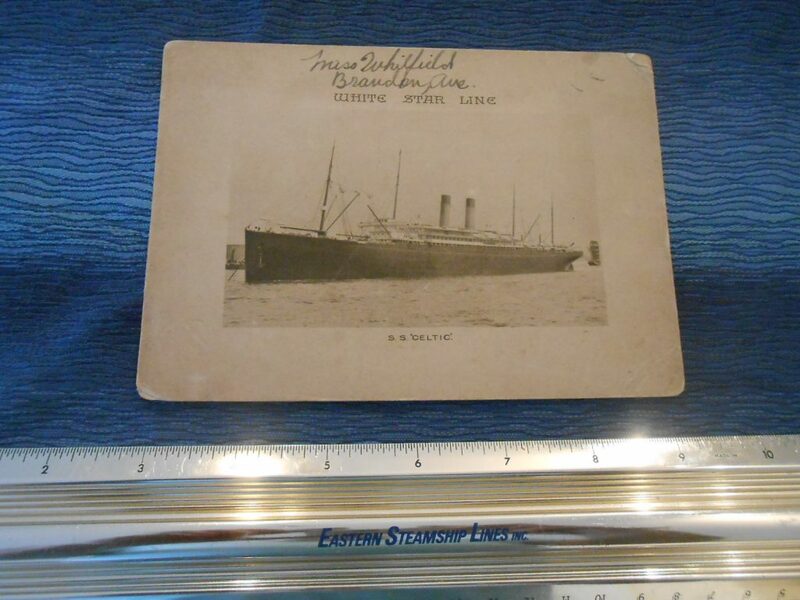 This one dates close to the time of the “new” MV Britannic.